With a certain amount of planning and realistic expectations, babies and toddlers are inexpensive to take on holiday! Until their second birthday they fly for nothing on a parent’s lap (and more often than not can be given a proper seat, except during take-off and landing), and their YSE holiday costs a mere £125 (please see below for full details). Looking after small children is always a huge responsibility, of course, whether one’s own or someone else’s. Chalets, with their wooden staircases and stone fireplaces are frequently less child-friendly than one’s own home, and difficult to make entirely safe. Please ensure that you read the chalet descriptions very carefully. We cannot accept more than one baby if all the standard beds in the chalet are filled with adults/children. Full-time childcare is indispensable, whether from a parent, grandparent, au pair from home or nanny hired locally. Small children probably won’t ski, even if dad is desperate for them to start preparing now for the 2034 Winter Olympics, though from about two and a half, bolder children might do a bit of gentle practice on the nursery slopes. 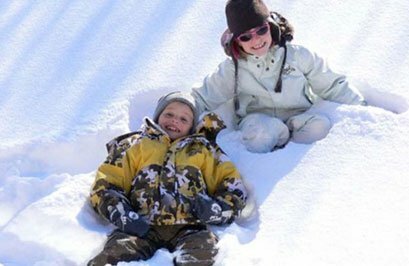 They will probably enjoy a little tobogganing, which is the perfect introduction to skiing. Basically, small children will have a ball if there is someone with them to build snowmen, play indoors, ride around on the buses (free for everyone) and cable car (free for under 5s), etc. Val d’Isère’s skiing nursery, The Village des Enfants, looks after children from 18 months, and any number of nannies, most of them British, are available through several different nanny agencies. Please see our Childcare page for a full list of childcare companies in Val d’Isère. You must come out with proper sunglasses or goggles for your baby, and a very warm hat and gloves are essential. Factor 50 sun cream (even in December and January) needs to be put on every day. Please note we cannot supply stair-gates in any of our chalets. The £125 we charge for babies and toddlers includes freshly-prepared puréed food. If you prefer, we can buy in formula or jars of baby food but you would have to pay your chalet staff back for those. Please note, we cannot get the same types of formula or jars of baby food that are available in the UK. If you are happy to try the French brands ‘Gallia’ formula and ‘Blédina by Danone’ baby food, we can buy these in for you, but if you want UK brands we ask you to bring them with you. If you want to use UK supplies but don’t want to carry the extra weight, guests in the past have used these UK companies who deliver to your chalet. The delivery costs vary enormously (£12.99 for a 30kg package with British Corner Shop, £108 for 10kg with Travel Tots), and you need to allow up to two weeks for delivery, but it’s useful if you are keen to have familiar UK brands. If your infant/toddler under 2 is no longer eating puréed food and you would like us to provide child-friendly solids for him/her, please let us know. We can buy in Pampers nappies, nappy sacks and wipes. Tell us the size your require and we can purchase an initial pack and buy more during the week if required. Please bring your normal nappy rash cream as these are neither easily available nor cheap in France!